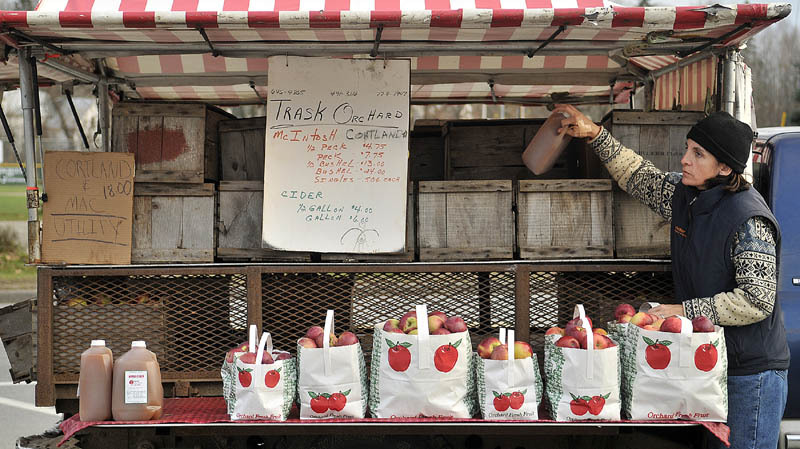 Jessica Sueiro, of Boston, stocks cider and apples on the Trask Orchard truck on Main Street in Farmington Friday afternoon. Sueiro said her parent's have owned the orchard for more than 45 years and she travels to Farmington each weekend to help out. Jessica Sueiro, of Boston, stocks cider and apples on the Trask Orchard truck on Main Street in Farmington Friday afternoon. Sueiro said her parent’s have owned the orchard for more than 45 years and she travels to Farmington each weekend to help out.